“Girl”, you know it’s true. Quite a few of you recently have been searching my blog for this new song from our favorite Mmmboppers, Hanson, probably because I’ve been listing it in consideration for my personal chart for a couple of weeks now. So, I’m glad you found it and welcome, of course! It should make it into my Top 10 Next In Line in the next few weeks and then we’ll see if it’s strong enough to make my top 40. For now, here’s a look back at the tremendous trio and their past releases, as well as their new one. If you haven’t heard it yet, I think you’ll be pleasantly surprised by the results. As we know, the bodacious brothers that comprise the group are Isaac, Taylor and Zac. After performing together for some time, they signed to Mercury Records and released Middle Of Nowhere in 1997. They shined with their huge summer hit, “Mmmbop”, which spent nine weeks at #1 on the airplay chart. The album eventually rose to #2 and went 4X Platinum. The three followup releases to it were largely overshadowed by that massive song, which continued to secure airplay during the rest of the year. They were: “Where’s The Love?”, which quickly rose to #6 (but spent a paltry 12 weeks in the top 40), “I Will Come To You”, a ballad, which went to #17, and “Weird”, arguably their most mature release of the era, which only managed to climb to #32. Only “Mmmbop” and “Come” were issued with physical CD singles at a time when airplay-only songs couldn’t make the Hot 100, and both went top ten on that survey. A Christmas album, Snowed In, was released in November 1997. Due to a label restructuring in 1998, Hanson were transferred to Island Records and issued This Time Around in 2000. Reaction was mixed, though many complimented the band’s sound adjustment from bubblegum pop to a more pop/rock sound. It attained a Gold certification, but it was largely seen as a failure compared to their last album. “This Time Around”, the lead single, barely made the top 30 in airplay (#20 Hot 100), and “If Only” missed the top 40 completely. In the wake of this, label complications ensued, new material was rejected, and the boys eventually went independent in 2003 creating 3 Car Garage Records, or 3CG. The first album to come off of it, Underneath, came out in 2004. “Penny & Me”, which went to #2 on my personal chart, received minor airplay. It went to #10 in the United Kingdom. The Walk followed in 2007, followed by Shout It Out in 2010, which saw them introduce a soulful twist into their music. Two singles from it, “Give A Little” and “Thinking ‘Bout Somethin'”, made the top 30 on my chart. Hanson is, no doubt, blossoming as the power pop band that they’ve turned into. They’ve always had it in them, but I’ve especially noticed it in their last few releases. Shout It Out is totally under-appreciated in terms of national success. Their new single, “Get The Girl Back”, is another moment of musical mastery. It’s not exactly R&B and it’s not a straight-up pop record either. It’s a sort of fusion of them, but that doesn’t do it justice. How do you categorize a track that has a lyric straight out of the 60’s, the big band sound of The Blues Brothers, the 90’s guitar riffs of Fountains Of Wayne and a vocal that’s modern-day Hanson? How about just “great”? With Taylor on lead vocal, the track is a full-out jam and soars to new levels for the band. The song is currently at Hot Adult Contemporary radio now, though it hasn’t picked up any significant airplay as of yet. It’ll probably take a few weeks for program directors to consider it, so, you know, don’t go bombarding them with e-mails and requests just yet. An album is to follow on June 18 entitled Anthem. Listen to the track below and let me know what you think in the comments or on Twitter: @AdamFSoybel. It’s a summer smash waiting to happen, and just maybe he’ll find that girl again with his new hit song. 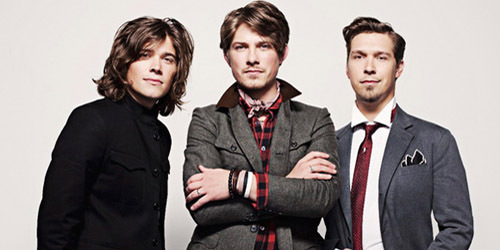 Listen to Hanson‘s new single, “Get The Girl Back”. / Pre-order “Get The Girl Back” on iTunes.